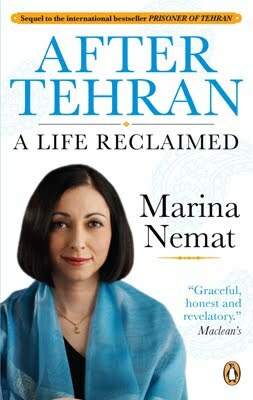 A year and a half ago, I read Marina Nemat's first book, Prisoner of Tehran, and absolutely loved it (I have to confess that my review was a bit of a rave). This is the sequel, and though it is a very different book, I loved it just as much. Prisoner of Tehran tells the story of the author's arrest and imprisonment in Tehran's Evin Prison at age 16 in the early days of the Islamic Revolution. She was held there for 2 years and when she was released her family and friends did not want to acknowledge what she had been through. She married her sweetheart from before her imprisonment and eventually emigrated to Canada where she lives today. This book tells the story of how she came to write Prisoner of Tehran. After her mother died in 2000, she started to experience hallucinations and flash-backs to the time of her imprisonment. In denying what had happened to her, she was denying part of herself. As she says in an interview that was posted today on the CBC website, "I decided that I had two options: one was to jump off a bridge, and the other was to write." I thought that the subtitle of the book was very appropriate - A Life Reclaimed. Prisoner of Tehran is written as a relatively straightforward narrative - a straight line going from point A to point B. It is so gripping that I couldn't put it down and I read it in a single day. This book is different in that it is more of a series of interconnected essays. The introduction describes packing a suitcase of items to take with her to the next world, and each of the 23 essays is named after an object that she would pack in that suitcase. They jump back and forth a bit, and describe the process of confronting her family about her experiences in Evin Prison; joining a creative writing class at the University of Toronto and working her way through several drafts of her first book; having the book published and distributed around the world and the aftermath of book tours and award presentations; dealing with people who denied the veracity of her book; and re-connecting with old friends from both her childhood and imprisonment. The narrative line also sometimes wanders back and includes some stories from her imprisonment and her life afterwards up to the present day. All in all, the essays together made for a satisfying, and equally compelling if less gripping read as compared with the first book (I read most of this book in one-essay chunks at bedtime). One thing that jumps out at me from both books, despite their dis-similarity is the author's voice. It is so clear and engaging and distinctive that it makes the books a pleasure to read. She is writing in her second language; and I only wish that I could write half as well in my first language! I suspect that she is finished now writing about her life, as there is an air of finality about this book that wasn't there in Prisoner of Tehran (because her story didn't end there). But I hope that she continues to write and publish books and I will be the first person in line to read them! A-ha, I can see why you'd like to make it to the Kama reading! I haven't read this one, only her first--looks like I should pick this one up too.